For about three quarters of air travellers in the world, and for all who fly local airlines, boarding a plane means being disconnected from the world. It means being cut off from their offices, businesses and loved ones. Not anymore, because in-flight connectivity (IFC) is improving with changes in technology. 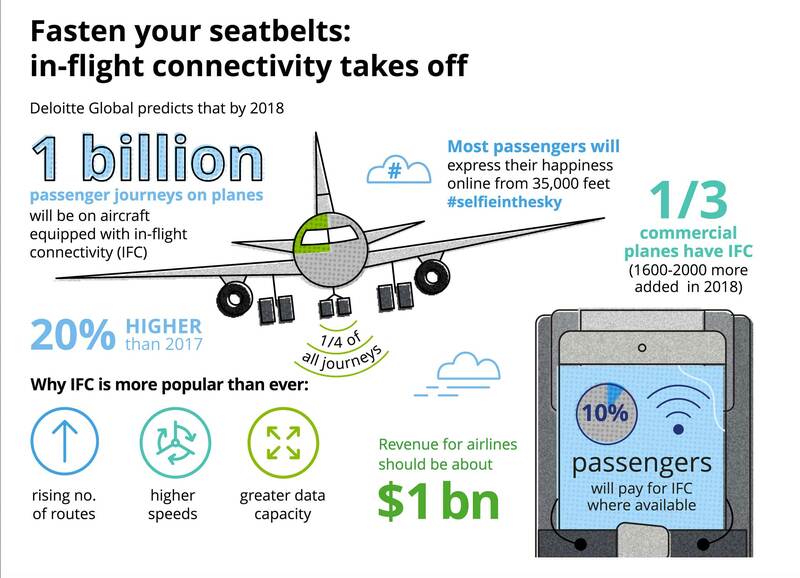 “As connectivity improves and becomes cheaper, in-flight connectivity is likely to become standard,” predicts a 2018 Deloitte Global report. “The plane will be connected and the majority of passengers will be delighted by this and express their happiness from social networks from 35,000 feet up,” the study observes. According to the 2018 Wi-Fi Report by Routehappy, 82 airlines around the world now offer in-flight WiFi – a 17 per cent increase compared to airlines that offered the same in 2017. Many of the early adopters, particularly those in the US, have embarked on system upgrades, while many others are taking their first steps into the world of connectivity. British Airways’ first WiFi equipped aircraft are now airborne and by 2019, the carrier expects to have 90 per cent of its aircraft connected. While some airlines in Africa have deployed in-flight connectivity, Kenya’s national carrier Kenya Airways is yet to. Last year, African airlines including Air Côte d’Ivoire and Air Mauritius were among those that began offering WiFi, while further afield Qantas, Virgin Australia and Air New Zealand improved their own connectivity offerings. “Until recently, many airlines outside of North America had taken a wait and see approach to inflight connectivity or had only partially equipped their fleets”. “But in 2018 and beyond, the business case for IFC should become more compelling due to technological advances in satellite and air to ground connectivity,” notes the study. According to telecoms engineering modules, there are two ways of providing connectivity to planes. Air to Ground (ATG) involves a network of specialised ground based mobile broadband towers which relay signals to antennas located on the underside of a plane’s fuselage. As with the mobile phone network, the plane automatically connects to the closest tower. There is also the satellite-based system which provides coverage across the globe including over the oceans where connectivity is via an antenna on the roof of the aircraft and satellites but whose technology is more expensive. Although KQ is not providing in-flight connectivity, it has sought to enhance the comfort of its passengers by enhancing its in-flight entertainment service. The airline announced last October that it is to deploy a wireless in-flight entertainment system on its Boeing 737-700 and Boeing 737-800 aircraft. Kenya’s flag carrier chose to introduce the system dubbed Everhub from Irish company, Inflight Dublin. Everhub is a cutting-edge inflight entertainment system that enables passengers to engage with entertainment, on-board retail and destination services via their mobile device or laptop. Passenger can stream video and audio files, read publications, review city guides and view a live moving map. They can also review duty-free and snack-bar products and plan and book destination services. Inflight Dublin has been providing all inflight content to KQ for the past three years. KQ has 43 passenger aircraft, comprising; eight Boeing 787–8, 12 Boeing 737 (-700 and -800) and 15 Embraer 190.